“The Revenge of Color over Line” is a new exhibition in the Uffizi Gallery currently on display in the Cabinet of Drawings and Prints. It focuses on 16th Century Venetian painting style and its influence on artwork around Italy. These pieces are on display until January 8, 2017 from the Ashmolean Museum in Oxford. Since Tuesday, October 18, many captivated enthusiasts have marveled at the 43 newly exhibited drawings that have been preserved from the 16th century. The name “The Revenge of Color over Line” derives from the transition of the artistic time period where simple ideas that seemed impossible were properly implemented in art. Most importantly, the exposition credits the Venetian artists, mostly educated by the 16th Century Venetian School, for embracing the constant inclusion of vivid colors into their work over the use of strong lines. 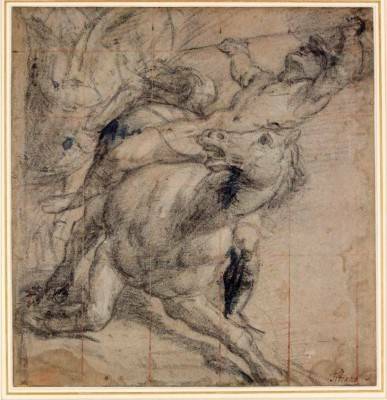 Jacopo Bassano, Tiziano Vecellio, Canaletto, and many more created a dialogue between their sketches and paintings with the rest of Italy, marking thier terratory with bright coloration and blurred lines. It is unavoidable to recognize the heavy use of red and blue of Venetian works and their contagious influence on the art around Italy. By accompanying sketches and oil paintings in the same gallery, even if they are from different cities, an interesting juxtoposition is created. The works exemplify a clear understanding of influence Venice had on the rest of Italy, and why these works continue to hail today. Attendees are able to enter into the mindset of the artists, to witness each motion of innovation, and to understand the sight of genius that changed the known art world. One can almost sense an artistic conversation through Italy, a communication through the arts based on inspiration and innovation. The 16th century was an extremely prominent period for European art that was primarily headlined by the work of Italians. Perspective, motion, and the third dimension were simply ideas that have never been successfully placed in artwork before. Having only been seen and created in the minds of artistic geniuses, long periods of trial and error made up many years of the 14th through 17th centuries before successful execution. Artwork advanced so greatly as the Renaissance thinkers broke from the flat work of Byzantium and created pieces that exploded from their flat backgrounds; the process is truly what is on display at the Uffizi. The pieces are found on the second floor, a room specifically chosen by Cardinal Leopoldo de' Medici to exhibit over 100,000 drawings from the most sophisticated artists of his time; Leonardo Da Vinci, Michelangelo, Raffaello, Sandro Botticelli, Filippino Lippi and many other Renaissance pioneers. It was a time where artists were not simply artists; they were scientists, mathematicians, and astronomers. They understood the world in a way that was so ahead of their time, some of their productions are considered “lost art” today. Emotions were evoked in this world of art, scandals were created, relations were made and alliances were broken. Everlasting legacies were produced and the priceless pieces and famous names of the 16th century Venetian School are learned today in the classrooms and desired to be seen around the world. The bright colors are a metaphor for the beauty of the port city and the desire to place it into art, the Uffizi embraces the vivid imagery by placing them in the same vicinity as other paintings from the same era to challenge its revelers, does color triumph over line?